950+ backcountry tramping huts that provide an acceptable level of accommodation, at least for the unfussy. Plenty of fabbo and speccy NZ valleys to wander along and passes to climb. So many possibilities in a variety of terrains. The choice is narrowed down with the pragmatics: time available; access to the start and getting back to civilisation at the conclusion, in your exhilarated if someone weary state; the prospective weather conditions; etc. Here’s the first 35 suggestions for tracks in the South and Stewart Islands that will remove you from circulation for a week or more. And there’s always Te Araroa so that makes one more. Gunna add to the list in time . . . The best long distance, all season, tramp in New Zealand — North-west Circuit in Rakiura National Park, Stewart Island. Includes the best opportunity to spot a kiwi in the wild for nothing. The best energetic overnighter around, highly debatable this one — Lake Angelus, Nelson Lakes National Park. Spend a second day and climb Angelus Peak for the full benefit. Easiest beginner’s tramp with plenty of company and often spectacular coastal scenery — Coastal Track in Abel Tasman National Park. Easiest beginner’s tramp if you prefer very much fewer companions and walking through, but not really over, the mountains — St James Walkway, North Canterbury. The best I-want-to-get-away-from-absolutely-everyone-and-stand-on-the-edge-of-the-world tramp — Southern Circuit in Rakiura National Park, Stewart Island. Not for beginners. Best overall bang for your money, but not in winter — Alpine Route in Mt Richmond Forest Park. Although the Lewis Pass to Lake Rotoiti runs it close. Neither are for novices or those without the full gear. Handiest Great Walk — Kepler Track. The Milford has the reputation for the best Great Walk in the country but it’s always fully booked. Why not walk this spectacular track instead, you just stroll down to the start from the centre of Te Anau? Since the early days of the MOW Hut, say 1985 when the current hut book was established, only around 50 parties have claimed to have done the trip in either direction. 50 parties in 30+ years. Expect to pop out the other end looking like you’ve spent time in a cage of feral cats. Exhilaration plus!! On a clear day you can see forever. In a fine spell of weather this might be the the best tramping in the north of the South. Sometimes exhilaration requires effort, the views here, more than one 360°, are worth the toil. Bad weather or winter trips? Not at all recommended, there are a few days oscillating around the 1500m mark, walking on ridges, fully exposed to wind and the elements, and it can do the full-on howl up there. History, views, pristine forest, a big river gorge. The Old Ghost Road is New Zealand’s latest named track, just opened in December 2015, and offers a lot. In fact, it’s entirely audacious. 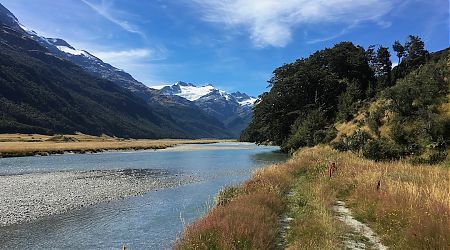 If you have a desire for an excursion into typical Marlborough territory, the Leatham/Molesworth route might satisfy your curiosity, as it takes in forests, alpine passes and long grassy valleys. There’s more to Nelson Lakes than the four day Travers-Sabine circuit, why not do the full spin of the park. That will keep you out of civilisation for a while, if you are feeling frisky. This route gets you to some out of the way places: Bobs Hut and East Mataki Hut don’t get so many visitors, 10 parties, maybe, each year. Need any more convincing? A not-too-excessively challenging experience to acquaint beginners with tramping for longer than a weekend, a scenic Little Adventure through the mountains without having to actually climb them. Water runs into the pools at 57° C or thereabouts, and the hut warden attempts to maintain the temperature around the 39° C mark to avoid cooking weary bodies. Don’t be mistaken by the relatively short distance, it’s actually one of the more energetic of the named tracks around. There is about 3000m climbing involved, that’s a fair grunt, in fact little of the track is flat, don’t bother bringing unneeded luggage. 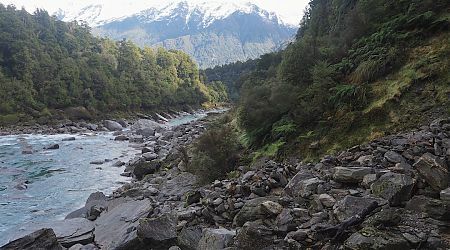 No mountain passes, no major climbs, all creeks bridged if you class those three-wire structures as a bridge, attractive huts, the Hollyford is a go to, all year round track, unaffected by avalanches in the colder months, unlike most of the tracks in the South Island. The major problem, there’s so much packed into a relatively short track, it is possible to walk it in a single, long, day, that those with a Destination Imperative, or simply the urge to hurry along, can wander past the highlights without giving them the attention they might deserve. The major thrill is this: there’s something special about standing high on a mountain looking down on the remote South Fiord of the lake, 1200 m below, mountains in every direction, knowing there are no towns, settlements, roads, farms, indeed only mostly wilderness wherever you gaze, basically standing on the perimeter of the Earth, looking out to forever. The North-west Circuit appeal is this: there’s not so many places where you can wander the coastline for more than a week without intrusion by civilisation with a variety of landscapes to traverse, big tree forests with a crown fern understorey, golden sand beaches and their sand dunes, bouldery beaches, scrubby, small tree, wind shaped forest, and, at the end of the day an acceptable standard of accommodation, at least for the unfussy. 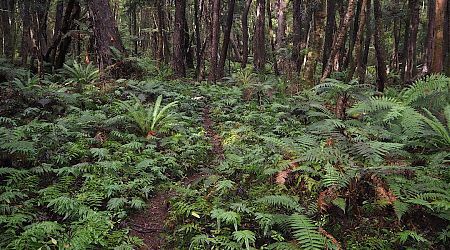 The track with the best that tramping in the Rakiura National Park has to offer — the views from Adams Hill, if you get to contemplate them with benign weather and everything around Doughboy Bay, the view from Fred’s Camp — as well as the worst — the real, bottomless bogs. For those who feel that Stewart Island’s Southern Circuit is not sufficiently arduous and demanding, and that would be a tiny subset of the population, there’s always the Tin Range route over to Port Pegasus for the full New Zealand tramping experience. No track, no huts, no route on the map.